My favorite meal on my recent trip to Europe with Mr. Smitten, my sister and her hubby wasn’t at the Michelin Star awarded Le Jules Verne, located hallway up the Eiffel Tower. It wasn’t our delicious dinner at the hippest hotel in Amsterdam, The Hoxton. It wasn’t even our beautiful breakfasts or dinners aboard our U by Uniworld river cruise, meticulously curated to accommodate my dietary restrictions. Rather, the dining experience that made my heart (and taste buds) sing was a smorgasbord of fresh raspberries, truffle brie, olives, macarons and white wine that we enjoyed while sitting in the grass at the end of the Palace of Versailles’ Grand Canal—the sun warming our faces and our Fat Tire Tours guide, Nick, recounting the ground’s storied past. The moment was a perfect pit stop halfway through the day, which had started in the morning in the heart of Paris. We met Nick outside a café before boarding the RER train for our 20-minute ride to Versailles. 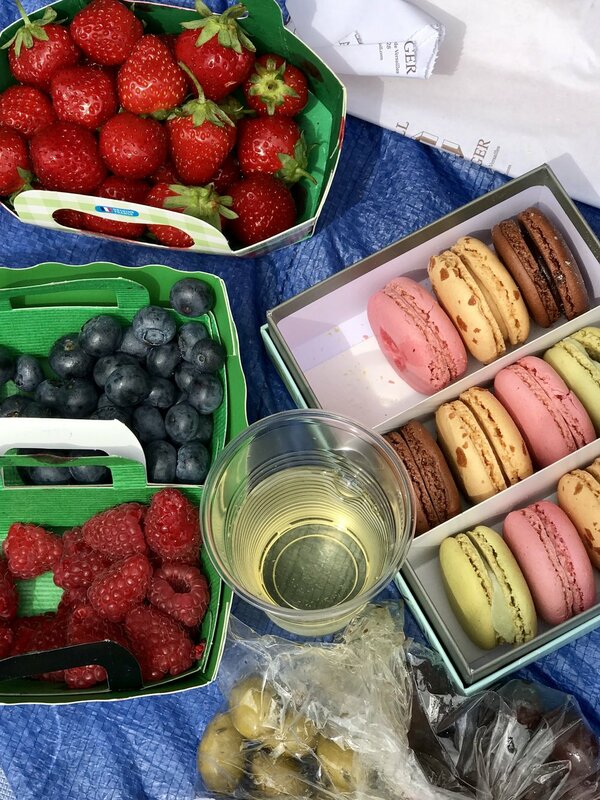 Then, we picked out our bikes and pedaled to the Place du Marché Notre Dame—an authentic indoor/outdoor market with everything you could ever need for an epic royal picnic. After an hour of shopping and our bike baskets bulging with provisions, we cruised for the palace. I had picked this tour in particular for our vacation, because, having had already explored the palace on a previous trip, this time I wanted a more in-depth experience (i.e., to see corners of the elaborate property that most tourists don’t get to visit, meaning to explore both the palace and its sprawling gardens). I’m pleased to report, mission accomplished: An insider’s look is exactly what we got. Thanks to Nick, our group covered about eight miles, winding our way along picture-perfect tree-lined paths and manicured flower beds. 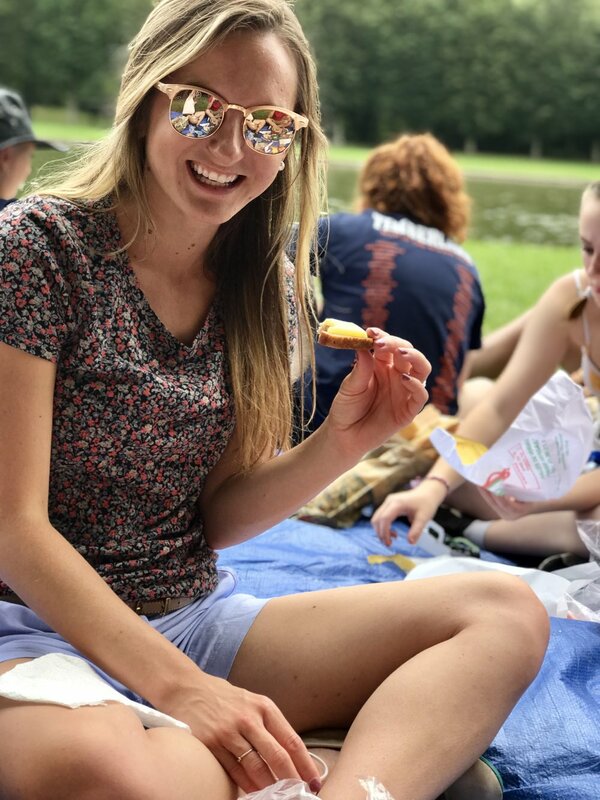 Throughout it all, we learned how the elaborate one-mile long, cross-shaped Grand Canal was commissioned in the late 1600s for boating parties; toured the Trianon Palaces and Marie Antoinette’s estate; and, at the end of the day, enjoyed skip-the-line access to the palace itself. Oh—and somewhere between all of this we were also able to relive the French Revolution via Nick’s detailed (and intriguing) narration, all while we overlooked the very grounds that played such a pivotal role in the historic moment, ate the goodies we’d purchased that morning and sipped French wine. 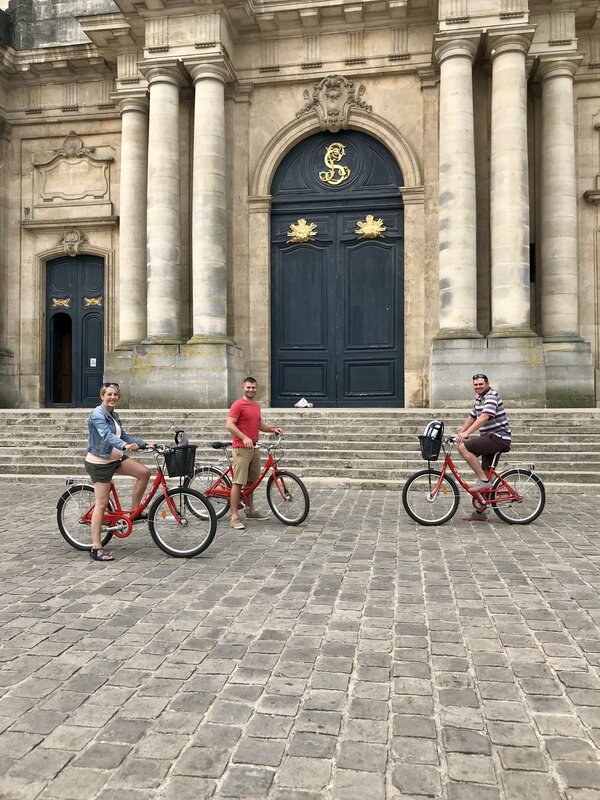 Honeymoon tip: For a more authentic, active honeymoon experience at the Palace of Versailles, ask your travel consultant about Fat Tire Tours’ Versailles Bike Tour, which far surpassed my expectations. This tour was one of my absolute favorite travel days—EVER!